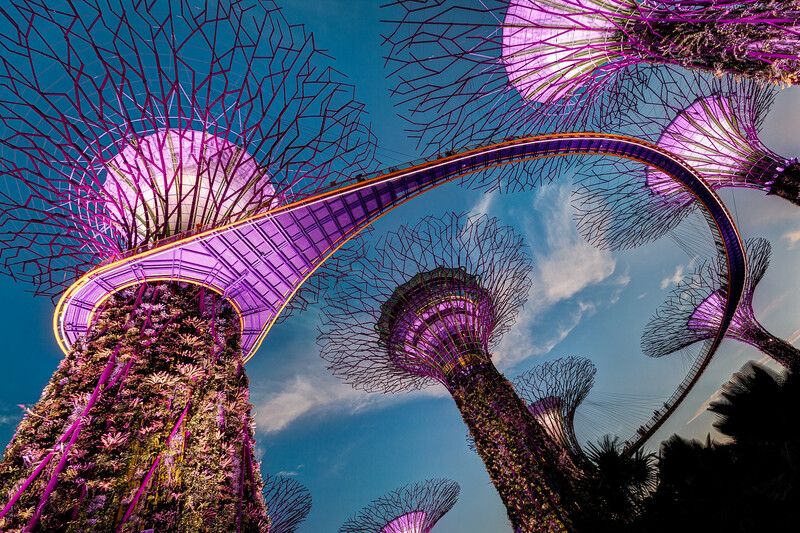 Since I started traveling I have wanted to visit the Supertrees in Singapore. Last month I too the very long journey to see them. The area is part of the Garden by the Bay, a park that melds into the overall Marina Bay area. The entire area is a architectural biological and technological wonderland! The Supertrees are solar powered, but that only scratches the surface of this amazing place. All the stories I recall from the news had me a bit worried about my visit to Singapore. I take a medicine that is not allowed to enter the country and generally I don’t worry about my prescriptions (my doctor gave them to me after all), but I worried in Singapore. The thing is, as has always been my experience with travel, I found something completely different than I expected. The people in Singapore and very friendly (almost too much so) and from ALL over the world. It seemed like everywhere I went I met someone from a different country. I met people from India, China, England, Vietnam, Germany, and many more places. It truly is a melting pot!